Supportive Partner Woman (crafter of fine mershed perderders!) and I had some company last night. It’s been awhile since we had the chance to entertain together, so it was a lot of fun. Prep work started Friday night. I whipped together a beef marinade, consisting of olive oil, lemon juice, soy sauce (reduced sodium), mustard and Worcestershire sauce. SPW and I found some lovely sirloin cubes at Wegman’s during our last visit, so I threw those in the bag with the marinade and let them soak. I like marinades… not always the healthiest thing to add to the diet, but it’s a way to add a LOT of flavor and still have that stuff cook away. We paid a visit to the Corn Wagon, which, sadly, sold out. That happens if you don’t get there early enough. What else can you do? We also stopped for beer. See, SPW is a beer snob and this can be a long drawn-out process. We came back with a variety pack from Fort Collins Brewery. We tend to like the variety packs… adds a range of selections to your beer fridge and allows you to try a bunch of stuff without dropping $40 on a full case of something you hate. Plus, Pennsylvania makes it difficult to buy just a six-pack, unless you want to go to a place that’s licensed for six packs, then you pay through the nose. Post beer distributor, it was off to the grocery store. We had to pick up some produce and a few other sundry items. Then it was back home to cook. SPW has been living the Julia Child dream the past week or so, so she decided to use one of Julia’s recipes to create a beef brisket dish. It looked pretty, had wonderful texture, but I found the flavor to be a little muted. That was rectified, however, when you added some au jus to it. I grilled chicken and steak skewers that turned out tasting pretty darn good, if I do say so myself. Other than the aforementioned steak marinade, I made a chicken one with oil, vinegar, and a load of spices. Couldn’t find any “poultry seasoning” so I just threw a few extra pinches of this and that in the bowl. My secret ingredient was bacon salt. It gave the chicken the slightest hint of bacon-y goodness. Granted, it was easy to miss if you didn’t know it was there. Threw the skewers on the grill and let them broil away happily. 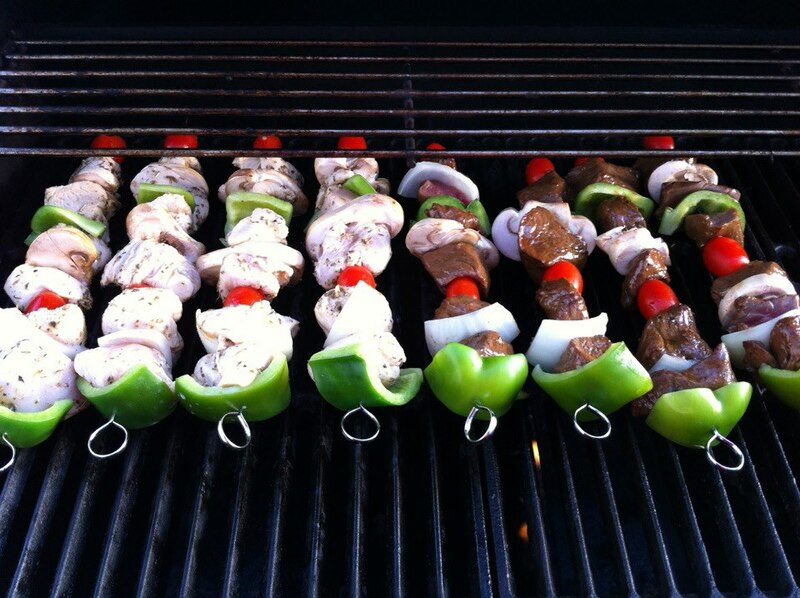 Also to the skewers I added some green pepper, some Mayan sweet onion, mushrooms and finished them with grape tomato. Adding the tomato to the end of the skewer had a two-fold purpose. First of all, grilling them really makes the sweetness come out, and secondly, the tomato sticks nicely to the skewer, keeping everything where it needs to be. Cooked them around 15 minutes. Started the temperatures pretty high to get a nice sear on the meat, then backed the heat off to finish. No complaints… and only two of them left. I did have a whoopsie, though… when putting the skewers on the serving dish, one of them went *plop* on the deck. Since my deck surface is not the cleanest place on the planet (read: pollen and whatever dust is drifting over from the new school construction site) I disregarded the five second rule and opted to pitch it. 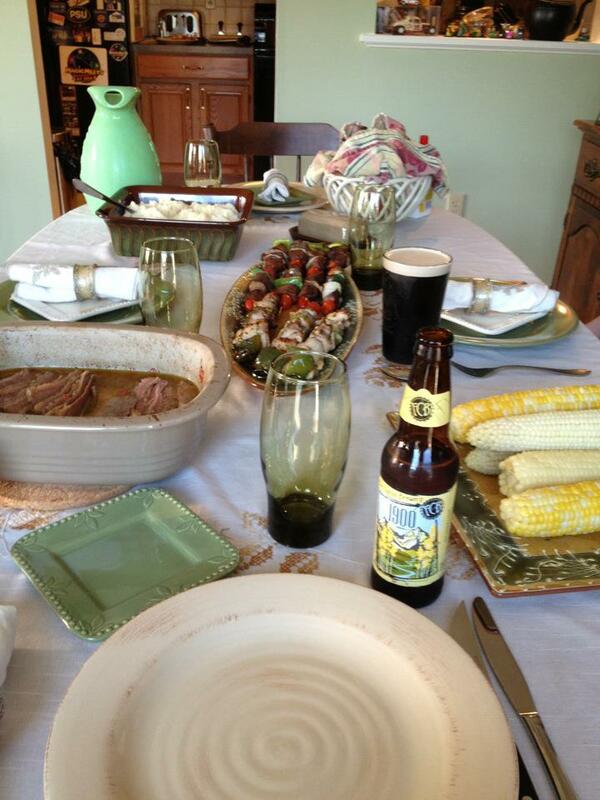 Most of the bounty on the table… still waiting on the broccoli. Thanks, Jed, for the picture! Dinner was a decent success. It’s always nice to cook for more than one or two, and we had enough food that no one went away hungry. It’s funny that both SPW and I like to cook, are good cooks, and don’t cook enough. This is why we’ve taken to a Sunday meal at home when she has to work and I have off (like today). Thinking I might make some of the marinated steak and pair it with a lovely piece of sockeye that we scored yesterday. Such beautiful color to that fish. So, post dinner and business, we adjourned to the Nerd Lair. I call it the Man Cave when SPW (The Management!) isn’t around, but when it’s coed, it’s the Nerd Lair. This is where I set up our home theater, as well as our bar. It’s basically the refuge from the everyday world. We’ve put a comfy couch down there, a couple of other chairs… bar stools (there are some things that you can’t do without) and a selection of adult beverages. I can’t really drink anymore, but that doesn’t mean drinking does not occur in the Nerd Lair. I’ve created a few twists on old classic drinks… one of SPW’s favorites is what I call my left-handed Philips head screwdriver. Take your basic vodka/orange juice combo, add triple sec for even more citrus flavor and for color, add a splash of pomegranate grenadine. It helps to use a decent vodka, and the official vodka of the Nerd Lair bar is Tito’s. I know… it sounds funny, a vodka called Tito’s, but this is one of the best vodkas I ever tasted and it’s half the price of Gray Goose. Straight on view of bar and back part. 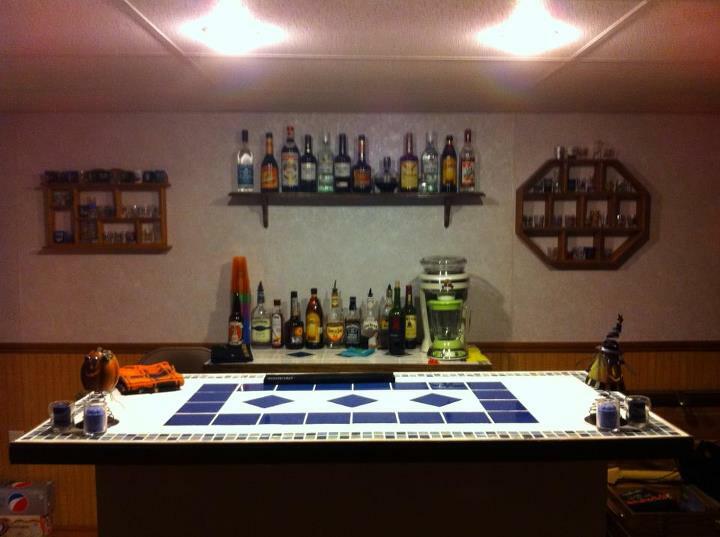 The Nerd Lair bar is actually something of my creation. 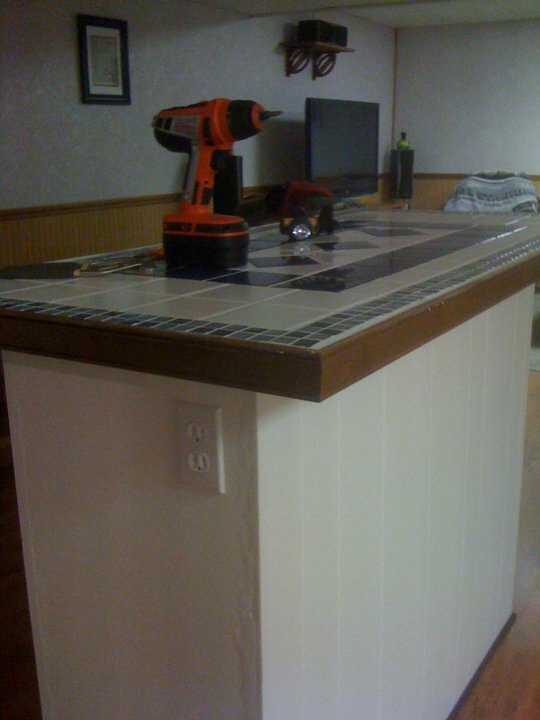 The main part started life as a cabinet I found at the Habitat for Humanity Re-Store. It was in some bad shape, but I stripped the old paint and refinished it. I also hand-built the tile tops for both pieces. That wasn’t fun… I’m not a great tiler, but I think they turned out looking pretty good. The back part was a custom build that I threw together last summer. We didn’t have enough space and I thought this would be a fun project. Wound up taking longer than I had hoped, but I was pretty pleased with the outcome. The nerd Lair also has a theme… Penn State. I know it’s unfashionable to be pro-PSU in this day and age, but both SPW and I are proud alumni and regardless of the Sandusky scandal, we still got a good education and made life-long friends. I think that’s going to do it for today. Have a bunch of stuff to accomplish and limited time to do it. Today also would’ve been my dad’s 77th birthday. Not a day goes by I don’t miss him, but some days are harder than others.